Bread is such a staple. Whether it is for your morning toast or your lunchtime sarmie, most people can’t fathom how to get by without their “daily bread”. Well first off, it is possible, as there are honestly so many options one can incorporate in place of bread – you just have to get a little creative. Secondly, you don’t have to go without if you don’t want to (cue big sigh of relief !) Going grain-free , sugar-free and low-carb isn’t about depriving yourself of the foods you enjoy. One just needs to use healthy substitutes. In this post I share a delicious bread recipe and also try and explain why regular bread (even the whole grain, low GI kind) is not as good as the food industry would make you believe. Bread is high in carbohydrates and will therefore spike your blood sugar. When your blood sugar is elevated, your body releases a hormone called insulin, which tells your body to store the excess energy from the glucose as fat. Even whole-wheat bread can spike blood sugar faster than many chocolate bars. Linked to the above point, when blood sugar is too high, it will also accelerate the ageing process through a process called glycation, which hits you right in your cells when blood sugar reacts with proteins in your body. Forget about the Botox ladies, it is cheaper to just cut out the wheat and sugar to avoid those nasty wrinkles. Evidence is mounting that a significant percentage of the population has an issue with gluten. Gluten causes an immune response in the digestive tract of susceptible individuals. This can cause digestive issues, pain and bloating. Unfortunately most breads are made from grains which contain gluten – yes, even rye bread and spelt is problematic. So if your flatulence is causing you (and those close to you) some distress, say no to bread and see what happens. Most grains also include the “anti nutrient” called phytic acid. Phytic acid is a molecule that strongly binds essential minerals like calcium, iron and zinc, preventing them from being absorbed. Our food quality is so compromised already due to long distribution chains and storage – we really shouldn’t eat something that makes the situation worse. Besides, there is NO nutrient in bread that you can’t get from other foods in even greater amounts. …… then don’t buy bread at the shops but rather make your own. Here is a delicious Banting seed loaf recipe. It is really easy to slice, freezes superbly and toasts really well. No fancy bread makers or kitchen equipment required. Although you will require a blender or coffee grinder to mill the seeds. There are also lots of other recipes available on the internet you can try. Just get Googling. Give it a bash and see if you could give up your unhealthy regular bread for bread that is actually good for you. 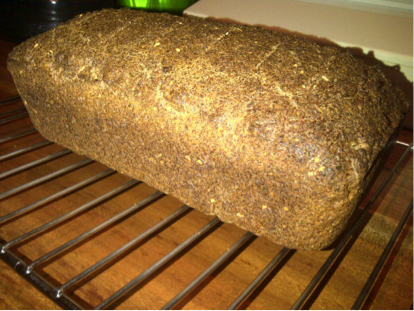 Posted on May 31, 2014, in Primal 101 and tagged banting bread recipe, gluten-free bread, grain-free bread, primal bread. Bookmark the permalink. 7 Comments. We always make this banting seed loaf. It is really delicious and easy to make. Have you got any idea how to work out the nutritional information per slice or per 100g for this bread? Perhaps try entering the recipe into http://www.MyFitnessPal.com and I think that should give you the required nutritional information. Where is the recipe? I only see the picture of the bread. There is a link provided in the body of the post. Lowcarbers abstain from or reduce drastically bread made from grains. Many people fail to understand that even low GI and gluten free breads are not all low carb friendly because their carb counts are high. This spikes your insulin thereby not helping your weightloss, inflamation and health issues.